This is the Format tab of PDF2XL CLI's options dialog. Click on any option for an explanation on what it does. Checking this option will ensure that only the characters in the box will be converted in columns and fields marked as numeric. This character set will also be used to limit the OCR engine when performing OCR on columns and fields marked as numeric. Checking this option will ensure that only the characters in the box will be converted in columns and fields marked as currency. This character set will also be used to limit the OCR engine when performing OCR on columns and fields marked as currency. Checking this option will ensure that only the characters in the box will be converted in columns and fields marked as date. This character set will also be used to limit the OCR engine when performing OCR on columns and fields marked as date. Checking this option will ensure that only the characters in the box will be converted in columns and fields marked as time. This character set will also be used to limit the OCR engine when performing OCR on columns and fields marked as time. If this option is checked, PDF2XL CLI will move any negative sign on the right side of numeric fields to the left, so Excel will be able to regard the data as a number. If the box is cleared, the numeric fields and columns will not be changed. If this option is checked, PDF2XL CLI will replace the parentheses around numeric fields with a minus sign on the left. If left unchecked, numeric fields and columns containing parentheses will remain unchanged. Any character in this character set will automatically be converted to the minus (negative) sign in fields and columns marked as numeric. If this option is checked, PDF2XL CLI will retain the relative indentation of all the columns or fields marked as text. This will affect all the lines of text in case of fields or cells containing more then one line of text, if the Keep Line Wrap option (under Text Columns) is checked. Checking this box will ensure PDF2XL CLI will keep line wrapping for all fields and cells marked as text when converting. Note that line wrapping will not be kept for CSV or Clipboard conversions, due to the fact the Excel and similar applications will not receive the data correctly in such a case. If this option is unchecked, PDF2XL CLI will remove any superscript data from the conversion. This is mostly useful when there are footnote or annotation marking next to numbers, and you wish to ignore them when converting so Excel won't consider them a part of the number. 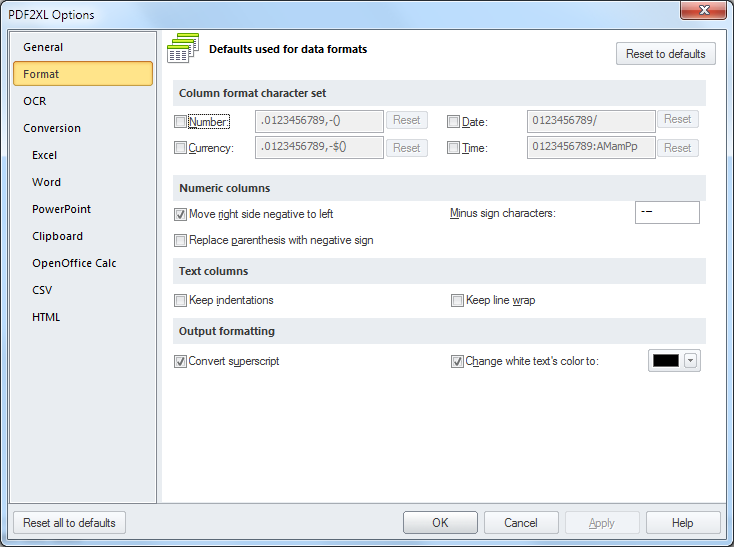 When converting data using the font's attributes - specifically, color - white colored text can disappear if the background color of the resulting document is white; as the default background color of Word and Excel is white, this can cause some issues. This setting can fix this problem by letting the user select the output color for white and nearly-white colored text; the user can keep the original color by clearing the check box. Note that this problem only occurs if the user set the Keep Text Attributes option for either Excel or Word and Powerpoint in the Output Settings page of the Settings dialog.